Excerpt from England to Delhi: A Narrative of Indian Travel The journey described in the following pages was undertaken from a desire to form some personal acquaintance with a country chiefly known to me through the medium of a close mercantile connection. In a word, business, no... read full description below. 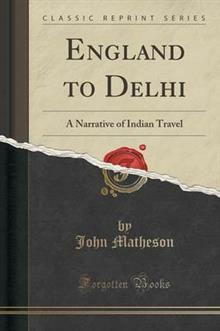 Excerpt from England to Delhi: A Narrative of Indian Travel The journey described in the following pages was undertaken from a desire to form some personal acquaintance with a country chiefly known to me through the medium of a close mercantile connection. In a word, business, not bookmaking, was its primary object. No one, however, who visits our Eastern empire can fail to be forcibly impressed with the novelty of its aspect, and with the strong contrast which it presents to the ordinary routine of European life. About the Publisher Forgotten Books publishes hundreds of thousands of rare and classic books. Find more at www.forgottenbooks.com This book is a reproduction of an important historical work. Forgotten Books uses state-of-the-art technology to digitally reconstruct the work, preserving the original format whilst repairing imperfections present in the aged copy. In rare cases, an imperfection in the original, such as a blemish or missing page, may be replicated in our edition. We do, however, repair the vast majority of imperfections successfully; any imperfections that remain are intentionally left to preserve the state of such historical works.